Haq's Musings: Will Pakistan Benefit From LNG Glut Pushing Prices to New Lows? Will Pakistan Benefit From LNG Glut Pushing Prices to New Lows? As recently as two years ago, LNG shipped to big North Asian countries like Japan and Korea sold at around $15 to $16 a million British thermal units. This month, the price has already hit $6.65 a million BTUs, down 12% from September, according to research firm Energy Aspects. It expects prices to fall further in Asia next year, to under $6 per million BTUs, as a wave of new gas supply in countries from the U.S. to Angola to Australia comes on line, according to Wall Street Journal. This is a great opportunity for Pakistan to take advantage of historically low LNG prices to alleviate its severe load-shedding of gas and electricity. Recently, Pakistan has launched its first LNG import terminal in Karachi and started receiving shipments from Qatar. Pakistan has also signed a $2 billion deal with Russians to build a north-south pipeline from Gwadar to Lahore. But the country needs to rapidly build up capacity to handle imports and distribution of significant volumes of LNG needed to resolve its acute long-running energy crisis. There is alot of confusion in Pakistan regarding LNG and that is due to some present and ex top man of one of the gas utility company. They have created so much confusion in the transaction that every one is afraid to enter into one. You can now well understand the LNG scam. The LNG purchase price in Pakistan's long term contracts has not been disclosed yet but purported to be around USD 9-12 per MMBTU. With spot prices predicted to be much lower in future, there will be windfall profits for the Pakistani sponsors. Keep in mind that LNG contract with "Qatar" is not Pakistan-Qatar govt to govt (G-to-G), but with Pakistan's private entities; the impression being given by Nawaz and cronies to Pakistani public is of G-to-G contract. Under such LNG price forecasts, no sane and honorable entity will go into long term purchase contracts. The rulers of Pakistan an exception because they're either stupid to the extent of being insane, or dishonest to the core. Probably both as they usually sell out Pakistani interests very cheap. Nawaz has recently agreed with Russia to build Iranian gas pipeline in Pakistan for nearly $2.5 billion with a Pakistani company's participation at about 20% in it. This is when the Iranians already have an offer on the table for four years to build the same pipeline for about $750 million, with the entire funding provided by Iran on a very soft loan. Iranians also built themselves their own pipeline to Pakistani border, so we know that they know what they are doing. The $2.5 billion G-to-G agreement with Russia is for building a Karachi to Lahore pipeline for transporting RLNG imported at Karachi. There is another G-to-G agreement under finalization with China for building an RLNG import terminal at Gwadar and a pipeline from Gwadar to Nawabshah where it will tie-in to the Karachi - Lahore RLNG pipeline. This Gwadar - Nawabshah pipeline will be tied in to the Iran pipeline if and when it comes up. The illogic here is that when Iran Pakistan pipeline comes up, LNG terminals at Gwadar and Karachi will become redundant but Pakistan will still be paying the fixed capacity charge for the terminals. If Iran Pakistan pipeline doesn't come up, Pakistan will be paying take-or-pay charges to Iran. Can any one justify such acts which certainly will result in Pakistani gas consumers paying up for all the losses incurred because of Pakistani politicians' corrupt practices? LONDON, Oct 29 (Reuters) - A wave of liquefied natural gas due to hit energy markets over the next couple of years is expected to displace tens of millions of tonnes coal demand globally, helped by government initiatives to move away from polluting power generation. "In China, gas will be cheap, gas will be oversupplied, LNG will be oversupplied for the next 3-5 years and that will give an opportunity for policymakers to work harder to switch from coal to gas, but it will take time," said Torbjörn Törnqvist, chief executive of Swiss-based trade house Gunvor. When there is huge circular debt no additional investment can be made and one cannot take advantage of lower prices because of huge debt. Corrupt practices will hamper investment and future growth. Qatar and Pakistan will sign historical deal for the provision of Liquefied Natural Gas (LNG) in the mid of November and immediately after that the supply of LNG to Pakistan will be started through ships. The Jang Group has achieved the bullet points of this agreement. According to the agreement the Economic Coordination Committee of the Federal Cabinet will give approval to this 15-year deal for the purchase of LNG from Qatar at its meeting on Thursday (November 5) which will be presided over by Finance Minister Ishaq Dar. Federal Minister for Petroleum and Natural Resources Shahid Khaqan Abbasi will give briefing to the meeting regarding the LNG agreement. He will tell the meeting that Qatar will supply three million ton LNG to Pakistan through 52 ships annually. The price of the LNG will be attached to the price of Brent crude oil. Qatar will provide 400 million cubic ft natural gas daily to Pakistan which is equal to the present production of Sui gas field. The natural gas made by LNG will be provided to nine IPPS. These nine IPPs will produce approximately 1800MW power daily through LNG. Besides these nine IPPs the natural gas produced by this LNG will be provided to Nandipur Power Plant from March 2016 and this will decrease 25% per unit cost of production of power in Nandipur. The natural gas produced by LNG will also be provided to fertilizer factories including Pak-Arab Fertilizer and Daud Hercules Fertilizer which would help them produce Urea fertilizer and Phosphate Urea. This gas will also be supplied to CNG stations. Pakistan has been importing LNG from different sources including Australia, Nigeria, New Guinea, Spain and Belgium and also from Qatar since March 26, 2015. The private sector of fertilizer has purchased three ships so far and one ship of LNG has been purchased by owners of the CNG stations. According to the agreement Qatar will provide four ships of LNG every month. The LNG will be provided to brass and textile industries that are ready to buy LNG. The wheel of industry will start booming through such move. This will also create job opportunities for skilled, unskilled and unemployed manpower. It is also expected that gas loadshedding will decrease greatly for domestic consumers with provision of LNG to other sectors. DOHA Nov 9 (Reuters) - Pakistan has finalised a $16 billion liquefied natural gas (LNG) deal with supplier Qatar and shipments are expected to begin next month, Pakistani energy minister Shahid Khaqan Abbasi said on Monday. The amount is 1.5 million tonnes per year, the minister said, adding that the two sides had agreed a price. The two sides have agreed a price, he said without elaborating. I haven’t posted for a while but decided to do so to clear some very blatant misconceptions and fears surrounding the hydraulic fracturing process (fracking) from tight rocks (shales etc). 1. Are there risks associated with fracking? Yes. But are these risks greater than other mineral mining processes? No. The environmental footprint of surface mining is probably as destructive if not worse than the dreaded fracking. 2. Basic procedure of hydraulic fracturing is pumping in high pressured polymer water mixture (aka pad) followed by propane (sand of a specific date diameter size). The other idea is to injec fluids beyond the rock fracture pressures and create a fracture matrix to increase the permeability to allow the trapped hydrocarbons to flow to the wellbore. Water polymer mixture may contain toxins as described in a post above. But more environmentally friendly frac fluid are being developed and utilized at an increasing rate. 3. The problem with fracking is that most of action is taking place subsurface which leads to speculation by environmentalists while surface mining damage is mostly visible. 4. I would recommend fracturing be banned anything above than 150 meters below Base of Groundwater. Fracking should also be restricted in areas where there are geological faults and above than normal insitu stresses. Especially close to the Himalayan range. Fracking can cause induced seismicity. 5. As long as the Caprock (the rock formation above the shale) is not penetrated (this can be done through proper frac design ie minifrac) and through proper core sample analysis, and as long as the base of groundwater is safeguarded…. Then fracking is a very viable technology. 6. True… fracking technology has been around since the 1940s…. But now they are drilling the horizontal wells which are in the shape of an L …. And the horizontal section can be over 2km long! And they are fracking that horizontal section with 20 to even +40 stages stages of fracs per well… this have been unheard of even 5 years ago. In your analysis you state that after the production from a frac well they dispose for the frac fluid back into the same well. This could not be further from the truth. Disposal of frac fluid in the same well will be technically very difficult. Ideally disposal os into a permeable depleted reservoir where migration of fluids into another permeable zones is highly unlikely. 7. Yes, Pakistan allow shale development… but make sure you have proper regulations are in place! Yes. But you need to sign the contract, instead of just discussing it. Kiran: "Yes. But you need to sign the contract, instead of just discussing it." It's not wise to sign a long term purchase agreement when LNG prices are falling due to glut in the LNG spot market. Pakistan should wait until the spot market price stabilizes. Purchasing LNG from the government of Qatar at the rate of $8.64/mmBtu on the basis of a long-term agreement was an ill-considered and non-transparent move that our government was, until recently, ready to embark upon. Relenting to public criticism, the government has now called for bids to make the purchase. However, the big question remains. LNG is a very expensive option for importing energy. As it comes out of the ground it first has to be cooled to minus 180 degrees centigrade to turn it into liquid form. This is a highly expensive operation. Transport of LNG from one place to another requires specialised ships, which charge high rates. For loading and unloading these ships need special terminals where the liquid gas is turned into ordinary gas for industrial and domestic use before it can be pumped into our gas pipelines. These are prohibitively energy consuming and costly processes. Besides, there are pipeline losses along the way, not to mention transportation losses and costs. Thus a consignment that costs $8.5/mmBtu in Qatar may well cost a consumer, in say Multan, $11.5/mmBtu after taking into account all the transport costs. We just need to look at the international index for LNG as we can find for Brent oil. There are a number of international price indices for gas. The Henry Hub in the US currently prices gas at $2.13/mmBtu, the TTF index in France and Holland currently price gas at $5.3/mmBtu in pipeline ex-France. All are considerably lower than the $8.64/mmBtu quoted in the press as import price from Qatar. Instead of importing LNG, the most economical option would be to rely on gas in Pakistan. Currently our proven reserves are approximately 40 tcf of which some has been consumed. We also have approximately 105 tcf of unconventional shale or tight gas, and this is yet to be explored. Our neighbours Iran (1300 tcf) and Turkmenistan (600 tcf) hold the second and fourth largest gas reserves in the world (Qatar with 900 tcf has the third largest), whereas the Turkmenistan-Afghanistan-Pakistan-India (Tapi) pipeline is still at feasibility stage. Iran has already extended its pipeline to our border and is offering gas at approximately $3.5/mmbtu to potential investors in Iran. If we add transportation costs it would cost approximately $5.5-6/mmBtu in Punjab as opposed to $11.5/mmBtu for Qatar LNG. How much more expensive would LNG be? If we take 5,000MW as the additional installed power capacity that would run on gas, the demand for gas as fuel would be approximately 180 million mmBtu per annum. As mentioned above, the difference in cost between pipeline gas from Iran or other sources would be $5.5/mmBtu ($6/mmBtu as opposed to $11.5/mmBtu from LNG – at the power plant). Thus this would add approximately $1 billion per annum to the fuel cost or $20 billion for the lifetime of these projects. This money would be far better used for developing much needed social or physical infrastructure or for improving our security. Is there an urgent need to sign a long-term sale agreement? Due to faulty design our lone LNG terminal cannot receive (and has not received) any LNG carriers as the approach channel needs to be deepened and widened. This will take almost one year and cost around $100m. Therefore until this is sorted out a long-term purchase agreement cannot be effective. The current ad-hoc arrangement of sending the Floating Storage Regasification Unit (FSRU) to Qatar every two weeks for refilling can easily continue at spot rates as this at best is an interim arrangement. Asian liquefied natural gas (LNG) prices eased this week as two companies emerged as the front-runners to supply Pakistan with 120 cargoes between 2016 and 2020. The price of Asian spot cargoes for February delivery was pegged at between $6.90-$7.00 per million British thermal units (mmBtu), down from around $7.10 per mmBtu last week. Shell and trading house Gunvor are on course to supply Pakistan with 120 cargoes after both companies submitted the lowest offers in two highly sought after tenders. Jordan's National Electric Power Company (NEPCO) said its floating LNG import terminal was back working at full capacity after adverse weather disrupted operations earlier this month. NEPCO declared force majeure on the terminal on Dec. 5 due to strong winds requiring it be moved away from the jetty, a spokeswoman for the company said. Gas supplies to both Jordan and Egypt were disrupted for a few days before the plant initially resumed operation at half capacity, and then finally full capacity, the spokesperson said. Nigerian exports of LNG are recovering after a disruption in loadings last week led to reduced flows compared with November averages. Spurred by the gas demand growing to over six billion cubic feet per day (cfd) and depleting hydrocarbon resources, the government has adopted a multi-pronged strategy to ease Pakistan’s energy crisis. It is importing liquefied natural gas (LNG) in addition to pursuing long-term projects such as the Iran-Pakistan (IP) and Turkmenistan-Afghanistan-Pakistan-India (Tapi) gas pipelines. According to an official source, previous governments too unsuccessfully tried to import LNG. They failed because they adopted an approach where the supplier was supposed to develop an LNG terminal. “But the present government succeeded in providing the country with its first LNG-based gas within 20 months of coming to power,” he added. The government pursued a transparent process for developing a terminal and Engro Elengy built the SSGC LNG regasification terminal in a record time – the contract was signed on April 2014 and first gas flow was ensured in March this year. On the IP project, the government has done work on its part and is awaiting only relaxation or removal of international sanctions on Iran. The government has also recently broken ground on the Tapi project, which had lingered on for the last 25 years. According to the official, the first gas flow from Tapi is expected in December 2019. The government has also awarded several exploration licenses to discover more hydrocarbon resources and augment domestic production which is currently stagnant at four billion cfd. Pakistan is ready to complete the short final pipeline spur that would enable it to import natural gas from Iran once sanctions are lifted, according to the head of one of Pakistan’s state energy companies. “In the very near future we expect delegations from the two countries to meet,” said Zahid Muzzafar, the chairman of Oil and Gas Development Company, which is government-controlled, but has publicly traded shares on the Karachi and London exchanges. “Once we get the right signals from the international community and our own government’s decision we are all set to build that pipeline,” Mr Muzzafar said, referring to the expected lifting of international sanctions related to Iran’s nuclear programme that have restricted its oil and gas exports since 2011. Final clearance is expected this month. The pipeline spur would run from Pakistan’s port city of Gwadar, where it has nearly completed its first liquefied natural gas (LNG) intake plant, to Iran’s border 80 kilometres away. Pakistan has a rapidly growing need for natural gas and is also building a pipeline from Gwadar to the middle of the country as part of a network of pipelines that will include supply via Turkmenistan–Afghanistan–Pakistan–India Pipeline, or Tapi. Pakistan has long-term aims to be an energy transit country uch as Turkey, which connects central Asian oil and gas supplies to Europe and the rest of the world via pipelines that include the one that terminates at the Mediterranean port of Ceyhan. Pakistan’s strategy would link supplies in central Asia, including Turkmenistan, as well as Iran – which rivals Russia as the world’s largest holder of gas reserves, to the huge markets in China and India, as well as serving its own growing demand. Mr Muzzafar said additional supplies from Iran can be linked into the system that is being developed currently, which includes a US$2.5 billion project to complete the LNG terminal at Gwadar and pipeline it 700km to Pakistan’s mid-country, terminating at Nawabasah. First LNG cargo was bought on the spot market from Qatar. Pakistan has tendered for 60 cargoes over five years. Mr Muzzafar said, and the first successful bidders were Gunvor, a Russian-owned trading house, and Royal Dutch Shell. Asia represents more than 70% of world-wide demand for LNG, but Wood Mackenzie said demand from the region’s largest buyers dropped in 2015, including a first-ever decline in shipments to China, which dropped more than 1%, after years of double-digit growth. South Korean imports of LNG fell 11% on the year and shipments to Japan, the world’s single largest market, declined 4%, the report said. That was offset by growing demand from newer importers such as Egypt, Jordan and Pakistan, the report said. Lower prices for LNG will likely spur increased demand from other markets, including those with under-utilized LNG import capacity, such as the Britain and continental Europe, Mr. Giles said. “New LNG [production] will compete with existing gas pipelines in the European market from suppliers like Norway and Russia,” he said. Longer-term, lower LNG prices will prompt emerging markets outside of traditional buyers in Asia to build infrastructure needed to import LNG. It can take as little as six months to install a ship-based offshore regasification facility, Mr. Giles said. Energy giant Royal Dutch Shell is going to lose a five-year liquefied natural gas (LNG) supply contract worth over $1 billion as a Qatari company has agreed to provide the commodity at a lower price to Pakistan. Gunvor and Royal Dutch Shell had won supply contracts in response to the two tenders floated by Pakistan State Oil (PSO) a few weeks ago for bringing 120 LNG cargoes over a period of five years. Gunvor offered to bring 60 cargoes at 13.37% of Brent crude price whereas Shell quoted 13.8% of Brent crude price for another 60 cargoes. During negotiations after the opening of bids, Qatargas agreed to match the price offered by Gunvor, which was the lowest, prompting the government to consider scrapping the contract with Shell and award it to the Qatari company. This was disclosed in a meeting of the Economic Coordination Committee (ECC) on Wednesday this week, which approved a long-term LNG supply agreement worth $15 billion. The ECC was told that the government would save a substantial amount by transferring the contract won by Shell to Qatar at a lower price. However, Gunvor’s contract will remain intact. In the tenders, nine trading firms including commodities giant Vitol, Glencore, Trafigura, Marubeni and US-based Excelerate Energy had submitted bids but all were rejected. Owing to the plunge in crude oil prices, Shell is focusing on LNG business in the world market. During the previous Pakistan Peoples Party government too, Shell had tried to strike an LNG deal with Pakistan, but failed due to a controversy over the Mashal LNG project, which landed in the Supreme Court. Pakistan produces 4 billion cubic feet of natural gas per day (bcfd) against demand for over 6 bcfd. The government considers LNG as a fast-track source to bridge the growing energy shortfall. The lower price offer on the part of Qatar came after Petroleum and Natural Resources Minister Shahid Khaqan Abbasi visited Doha on January 6 and sought a reduction in the LNG rate. Qatar agreed to match the price offered by Gunvor for the short-term supply contract spread over five years. Earlier, Pakistan and Qatar had finalised a long-term supply deal at 13.9% of Brent crude price. The two sides are going to sign a commercial agreement as the ECC has given the go-ahead. Reports suggested that India had struck an LNG deal with Qatar at the lowest price, but Petroleum Minister Abbasi insisted the Indian price was 20% higher compared to the rate agreed between Islamabad and Doha. Under the proposed arrangement, the long-term LNG supply contract will be for 15 years, but it will be renegotiated after 10 years. The two sides can end the contract if they fail to develop consensus over the price. Every three months past price of LNG would be taken to calculate the price with Qatar. As part of the agreement, PSO will receive 1.5 million tons of LNG from Qatargas in the first year and the annual volume will be enhanced to 3 million tons from the second year. Long-term and cyclical shifts explain why the gap between the two fossil fuels has widened. The LNG trade has grown massively in the past decade (see map). Adrian Lunt of the Singapore Exchange says LNG now rivals iron ore as the world’s second-biggest traded commodity, after oil. In the past 40 years natural gas’s share of the energy mix has grown from 16% to more than 21%. Oil’s has shrunk. Gas generates 22% of the world’s electricity; oil only 4%. It might make more sense to tie the price of natural gas to coal, against which it competes as a power source. Moreover, during the current decade, the outlook for gas prices has become even more bearish than for oil. Sanford C. Bernstein, a research firm, reckons global LNG supply will increase by about a third over the next three years, pushing overcapacity to about 10%. (There is far less spare capacity in the oil market.) At least $130 billion of this investment in supply is in Australia, which within a few years will overtake Qatar as the world’s largest LNG producer. America will also add to the surplus. Its first, much-delayed LNG exports are due to be shipped from the Gulf Coast in weeks. Investment in the liquefaction trains, tankers, regasification terminals and other paraphernalia needed to ship natural gas was boosted by a surge in demand from Asia. Japan and South Korea scrambled for LNG after Japan’s Fukushima disaster in 2011 forced them to shut down nuclear reactors. China saw LNG as a way to diversify its energy sources and curb pollution from coal. Last year, however, those countries, which account for more than half of global LNG consumption, unexpectedly slammed on the brakes. The subsequent supply glut means that the spot price of gas in Asia has plunged. Those buyers who took out long-term oil-indexed contracts when crude was much higher are suffering. Mel Ydreos of the International Gas Union, an industry body, says that Chinese firms saddled with such contracts are urging suppliers to renegotiate them. He notes that a Qatari company recently agreed to renegotiate a long-term contract with an Indian buyer, cutting the price by half. The drop in Asian prices has brought the cost of natural gas traded in different parts of the world closer to each other. America is an outlier. 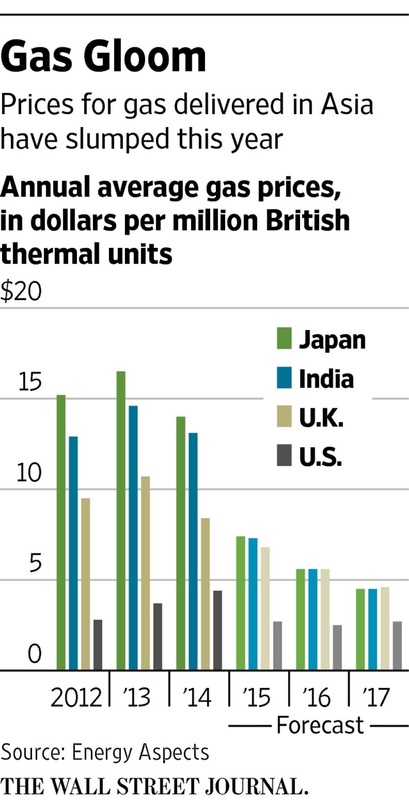 Thanks to the vast supplies unleashed by the shale revolution, its Henry Hub benchmark is by far the world’s cheapest, at just over $2 per million British thermal units (MBTU). But add liquefaction and transport costs, and American LNG prices rise above $4 per MBTU. In Europe and Asia they are a dollar or two higher. A few years ago the range would have been much wider, from $5 at Henry Hub to $19 in Asia. More homogenous prices are an important step towards a globalised market, says Trevor Sikorski of Energy Aspects, a consultancy. Qatar Liquefied Gas Co., the world’s biggest producer of liquefied natural gas, signed a 15-year contract to supply Pakistan State Oil Co. with 3.75 million metric tons of fuel annually, the Qatari company said. The supplier, known as Qatargas, plans to deliver the first cargo in March, the company said Wednesday in an e-mailed statement. Qatargas didn’t disclose the contract’s value. A proposed deal with Qatar for 1.5 million tons of LNG per year was worth $16 billion, Pakistan’s Petroleum Minister Shahid Khaqan Abbasi said during a visit to Doha in November. Pakistan plans to import as much as 20 million tons of the super-chilled gas annually, enough to feed about 66 percent of Pakistan’s power plants. A fuel shortage has idled half the nation’s generators. A 75 percent drop in LNG prices since 2014 has reduced the cost of the South Asian country’s energy needs. Qatargas, with annual capacity of 42 million tons, will supply Pakistan State Oil from joint venture plants it operates with ExxonMobil Corp. and Total SA. Pakistan State Oil shares rose 1.7 percent, the most since Feb. 4, to close as the leading gainer by points in Karachi’s benchmark 100 share index. Talks between Qatargas and Pakistani officials date back to 2012. Pakistan intended to buy 3 million tons of LNG per year, split between long-term and shorter contracts. The country’s state oil company decided to cancel a tender for 60 cargoes of the fuel in January. Pakistan’s Prime Minister Nawaz Sharif asked Putin to visit. Mobin Saulat heads Inter State Gas Systems, the Pakistani company that would build the pipeline. He says Putin may visit Pakistan before June. He says Russia is interested in the project because 200 million people live in Pakistan, and investing in the country could help Russia gain influence in other South Asian nations. When Pakistani officials and energy experts visited Moscow recently, they met with the heads of three large Russian energy companies for the first time in more than 20 years. He says that shows Russia’s interest in Pakistani energy issues. Saulat says he believes the pipeline is the first of many investments Russia will make in Pakistan. Experts say both countries may have strategic and political reasons to work together on the gas pipeline project. Pakistan has tried to form new partnerships to reduce its dependence on the United States and China. Russia will spend about two to $2.5 billion dollars on the project. That is almost 85 percent of the cost. The 1,100-kilometer-long pipeline will be able to transport 34 million cubic meters of gas per day throughout Pakistan from Karachi to Lahore. The first part of the project is expected to be finished in two years. The last two parts are set to be completed in 2019. As Pakistan blames the sanctions imposed on Iran for delaying gas intake from this country, however a Pakistani official claims there is another reason. Pakistani Parliamentary Secretary for Petroleum and Natural Resources Shahzadi Umerzadi Tiwana said that Qatar's LNG price is lower than the price of Iran's natural gas. that of Iran. In particular, she mentioned the recent $16-billion deal with Qatar, saying that Qatari LNG is low priced as compared to gas that Iran would be supplying to Pakistan. According to Pakistani sources, LNG arriving in any particular month will fetch 13.37% of the preceding three-month average price of a Brent barrel (considering the present Brent price as a proxy, that would equate to $167.5 per 1000 cubic meters). Comparing the figure with the revenues of Tehran gas deals with Turkey and Iraq, it indicates that Iranian gas wouldn't compete with Qatari LNG on Pakistani market. In 2014 Iran was exporting gas to Turkey at above $420 per 1000 cubic meters, but the figure plunged to $225 currently due to low oil price. Iran previously said that the price of gas for Iraq would be similar to Turkey. The price in Qatar-Pakistan's new LNG deal is very low. For instance, Tiwana said that the average price of LNG cargos imported so far by Pakistan State Oil (PSO) is $7.8224/MMBTU (million british thermal units). Converting BTU to cubic meters, then Pakistan imports 1000 cubic meters of gas at $291. Pakistan said on February 10 that it had signed a 15-year agreement to import up to 3.75 million tons per year of LNG, or more than 14 million cubic meters per day (mcm/d) of natural gas from Qatar. Iran also has a contract with Islamabad to export 22 mcm/d of gas to this country, while Pakistan should have started gas intake in January 2015, but yet to start construction of pipeline on its territory. Tiwana didn't touch upon any plan regarding the Iran-Pakistan pipeline, but said that an agreement for laying gas pipeline for bringing LNG from Karachi to Lahore had already been signed between Pakistan and Russia with worth $2 billion, projected to be completed by December 2017. The project doesn't have anything to do with Iranian gas. On the other hand, China is planning to start the construction of another pipeline from LNG terminals in Gwadar port to power plants in Navvabshah city (Pakistan). This rout can help the realization of Iran-Pakistan gas deal, because Gwadar port has less than 100 km distance from Iranian borders, but the low Qatari LNG price may discourage Islamabad from such a move. Turkish Energy Minister Berat Albayrak confirmed on Tuesday that the International Chamber of Commerce (ICC) has ruled in favour of Turkey in a dispute with Iran on the gas price, ordering a cut of between 13.3 percent to 15.8 percent. Speaking to reporters in Chile, where he is accompanying President Tayyip Erdogan on an official visit, Albayrak said the final price cut would be decided between the two parties based on the ICC's decision. "Once this ruling takes effect, we will see a discount in (domestic) gas prices this year," he said in comments broadcast on Turkish state television TRT. Engro Corp., owner of Pakistan’s second-biggest fertilizer maker by value, plans to expand its power generation business and build a second liquefied natural gas terminal, betting a revival in economic growth will boost demand for electricity. The Karachi-based company is looking at the possibility of constructing a 400 to 600 million cubic feet a day LNG terminal, through a partnership, for private sector companies, Chief Executive Officer Khalid Siraj Subhani, 62, said in an interview. It also plans to build a 450 megawatt LNG-fueled power plant for as much as $700 million, he said. Engro is also looking to invest overseas in energy and fertilizer after the firm sells stakes in existing businesses, he said. Engro is seeking to turn an energy crisis in South Asia’s second-largest economy into an opportunity as the government of Prime Minister Nawaz Sharif pushes to end shortages within two years. The nation is adding power plants with the help of Chinese investment and started importing gas last year with Engro building the nation’s first LNG terminal. Outages lasting 18 hours had led to street protests in Karachi as recently as June, while falling natural gas production at home forced companies to idle it’s plant. Engro is also considering investing in a fertilizer plant via a joint venture in North America or Africa, Subhani said. The target region will be identified by the year-end and the company wants to replicate a 72 megawatt power plant that it has already constructed and operate in Nigeria, with another facility planned in Africa’s largest economy and other possible projects in neighboring countries including Benin, he said. “International projects will be less capital intensive, and rely more on our skills and expertise,” Subhani said. He would like to see its international businesses contribute about 20 percent of total revenue within 9 years. Engro’s plan to expand abroad could be funded by selling stakes in its food, fertilizer and chemical businesses and the company may be able to raise $693 million at current prices, Danish Ali Kazmi, a senior research analyst at Alfalah Securities Ltd. in Karachi, said on May 23. The company has also sought approval from the government to export as much as 1 million tons of fertilizer, with India being the most logical market after slowdown at home, according to Subhani. Dutch dairy company Royal FrieslandCampina NV is conducting due diligence to buy 51 percent stake in Engro Foods Ltd. and ATS Synthetic Pvt. in Engro Polymer and Chemicals Ltd. It is also looking to sell up to 24 percent stake in Engro Fertilizers Ltd.
Engro’s shares rose 1.3 percent to 340.50 rupees, poised for their highest close since Aug. 11, at 10:48 a.m. in Karachi. This year Engro’s shares have risen 22 percent, outperforming the 12 percent gain of Pakistan’s benchmark index, the best performer in Asia after stake sale announcements. That’s despite the company’s 2015 annual 4.7 percent rise in revenue, the slowest rate in seven years.